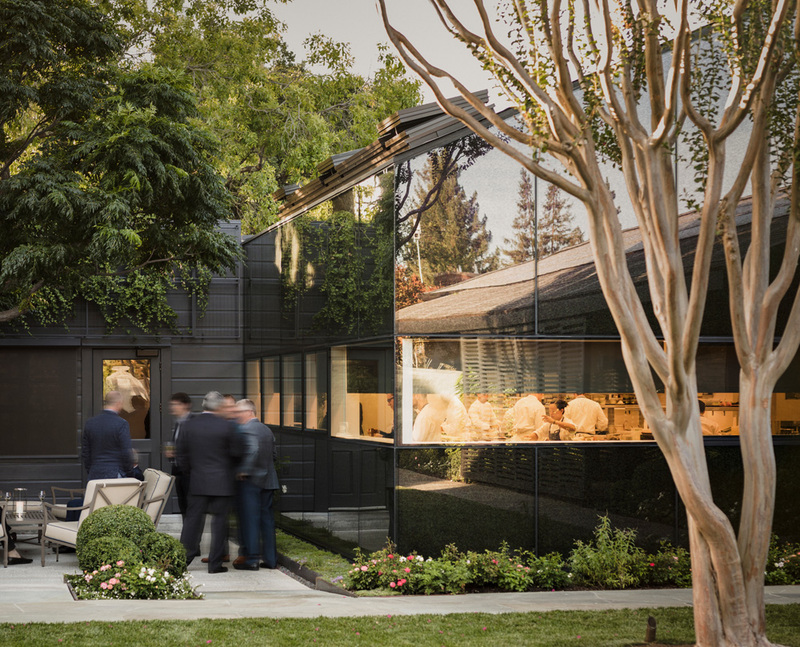 Snøhetta, celebrity chef Thomas Keller, and architecture firm Envelope A+D have completed work on a 4,430-square-foot renovation and expansion of the famed French Laundry restaurant in Yountville, California. The understated overhaul delivers a new kitchen annex that boosts the restaurant’s support functions by providing new butchery, produce breakdown, and wine storage spaces. The new expanded configuration will help Keller and his team “innovate their craft and service,” according to a press release. 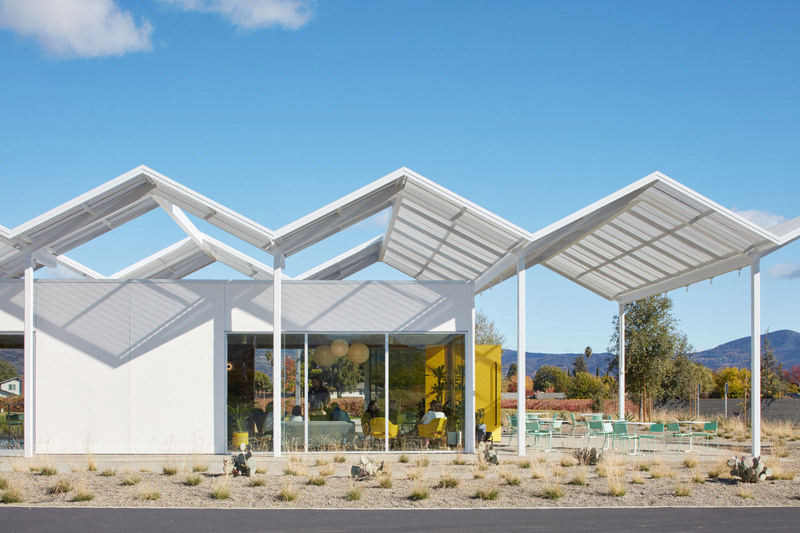 The new pitched-roof kitchen annex is tucked behind the existing restaurant cottage and is designed specifically to harken to utilitarian agrarian structures that dot Napa Valley. The gabled building is wrapped in charred wood siding along one side, with the facades facing a new interior terrace wrapped in black curtain wall glass. For these walls, the architects created a special curve-based frit pattern that is inspired by the ways in which members of the kitchen staff move while they work. This pattern is laid out along the lower sections of each of these facades, with transparent and opaque sections located above. The rustic-but-sleek annex is designed with no overhangs and a roof that meets flush with its supporting wall. The structure is sited so that it is among the first things patrons see as they enter the restaurant grounds, which have been reworked into a series of discrete courtyards in the scheme. The design team created a rusticated basalt stone wall marked with dramatic entry thresholds to wrap these newly-programmed garden spaces. Inside the renovated 2,000-square-foot kitchen, Snøhetta has installed a new wood-burning oven and rotisserie, while also expanding and rearranging the interior architecture of existing kitchen areas to include a greater amount of working space. The sun-lit kitchen is topped by two vaulted skylights that curve upward to meet the ceiling. The kitchen’s new bell-shaped ceiling conceals kitchen gadgetry and also enhances kitchen acoustics, according to the press release. Snøhetta also designed a pair of concave stainless steel work tables for the project that are located within the kitchen pass and are designed to allow people working at the table to stay out of the path of travel into and out of the kitchen. The renovated restaurant is open to the public, but if you want to see these new spaces yourself, it will have to wait—The restaurant is currently fully-booked through the end of May 2018.